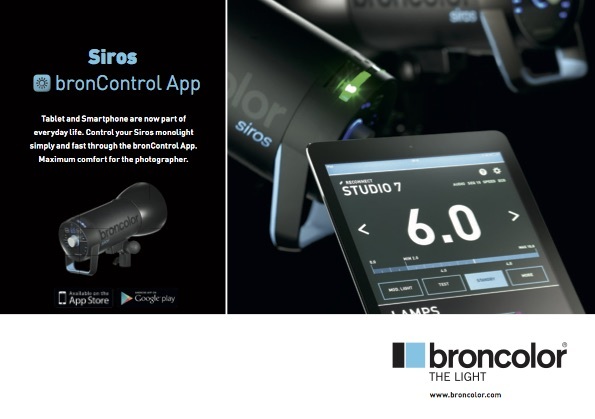 The latest version of “bronControl” enables control of the basic features of the broncolor Siros and Siros L battery monolights. In addition, it now displays the flash duration for each individual unit at a chosen power level. Some other new features include Synchronized Sequence, Freemask, Alternate, and Group. It is recommended that broncolor Siros user should sign up for the Siros Circle. The Siros Circle offers latest information about how to do Siros firmware update, new bron control app functions and updates. It also provides various tutorials and examples for Siros with and without battery. The bronControl app is available for free download from the Apple Store and Google Play. Broncolor expert photo instructor, Urs Recher explains functions like Alternate, Synchronized Sequence, Freemask and how to set them up so you can accomplish your creative ideas.